Cathay Pacific Airways today announced that it has expanded the code-share agreement with the Flybe Group that will connect passengers travelling from Hong Kong to four destinations in the United Kingdom via Amsterdam or Paris. Flybe is a British regional airline group based in Exeter in the south-west of England. Under the new code-share agreement, Cathay Pacific’s “CX” code will be placed on selected Flybe flights between Amsterdam and Birmingham / Southampton, and between Paris and Birmingham / Manchester / Exeter. Tickets for the new code-share services are now open for sale for travel commencing 12 January 2015. The arrangement will provide more choice, greater convenience and improved connectivity for passengers travelling through the Hong Kong hub to the UK. This also marks the first time that Birmingham is included in the code-share network of Cathay Pacific, and passengers travelling to and from the West Midlands city can take advantage of this new arrangement. 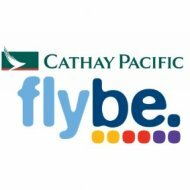 Cathay Pacific and Flybe already have a code-share agreement covering selected Flybe domestic flights between Manchester and seven UK destinations, namely Aberdeen, Belfast, Edinburgh, Exeter, Inverness, the Isle of Man and Southampton.